Tony Kubalak has been building high style period furniture since 1999. He specializes in building accurate museum quality reproductions of antique originals. 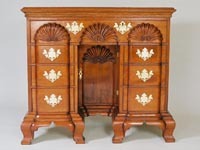 His favorite pieces are from the Philadelphia Queen Anne and Chippendale styles. 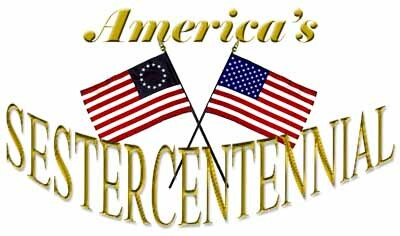 These are characterized by bold, elaborate carvings and classic 18th century lines. 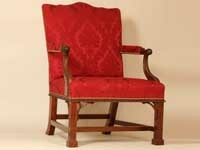 He also has an interest in a few Newport pieces, most notably the blockfront furniture. 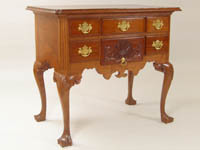 Kubalak became interested in period furniture about twenty years ago when he first saw pictures of some Newport shells. This initial interest lead to discovering other 18th century motifs, cabriole legs, ball and claw feet and foliage carving for example. His interest quickly evolved from admiring the shapes to wanting to know how to form, carve and build them. He spent the next fifteen years trying to learn, with mixed success, from books, tapes and an occasional class. 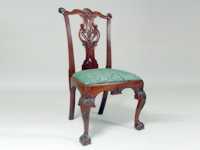 Although he developed solid woodworking skills in hand cut dovetail and mortise and tenon joints, as well as an occasional cabriole leg, he still was not able to attempt the pieces in which he was really interested. In fact he became resigned to never learning the specific skills necessary to build 18th century furniture. 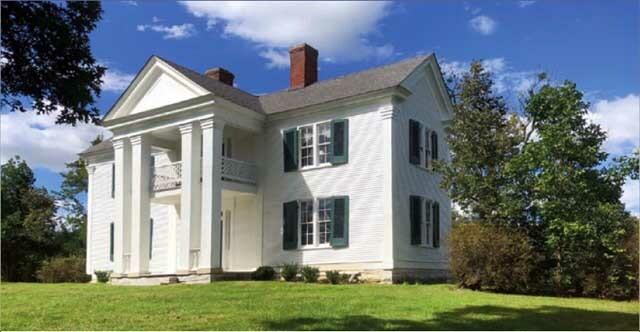 He became content with building pieces with a hint of 18th century design but without any ornamentation. This all changed in 1999, when he started to study with Gene Landon at the Olde Mill Cabinet Shoppe. With Gene's guidance and knowledge Kubalak has learned how to build the most elaborate and complex pieces in existence. His carving skills have improved to the point that he now looks for the most challenging projects to add to his collection. 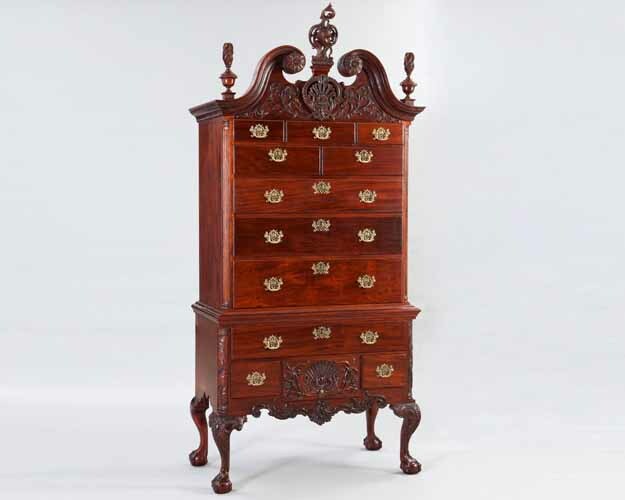 Kubalak's interest in period furniture has evolved from admiring the ornamental motifs to being committed to building authentic, faithful and accurate reproductions of the finest antiques. Thus a piece begins with doing research. This will include studying the original if at all possible, taking accurate measurements, including tracings of key and unique elements, and lots of photos. To maintain authenticity his pieces are built using the same joinery methods that were used on the originals. This means that all structural joints are either mortise and tenon or dovetail. Moreover, he does most of his work by hand using traditional tools. In his view this is the best and most efficient way to generate the shapes and character of the originals. For example a machine made ball and claw foot is an awful approximation of an 18th century one, whereas a well executed hand made one has all of the boldness, charm and detail of the original. 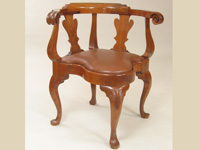 In addition the foliage carvings that are ubiquitous on 18th century furniture cannot even be approximated by any machine. Yet another step towards historic accuracy is his use of thick solid stock when appropriate and single piece boards wherever possible. Most of the fine old pieces used single board construction and solid stock for legs. Thus a piece would not look right if laminated wood were used. The final steps in producing an authentic reproduction involve the finishing process and the use of appropriate hardware including historically accurate nails. The finish is hand applied and care is taken to make it look aged. 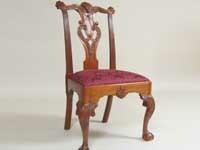 The ultimate goal is to build a reproduction that has the look and feel of a 250 year old antique. 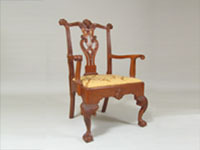 Kubalak has entered his work in the Northern Woods Woodworking Show for several years. Northern Woods is an annual show put on by the Minnesota Woodworkers Guild, of which he is a member. In the past two years he has won two awards, most recently he earned the best handwork award for his reproduction of a Newport six-shell desk and bookcase. 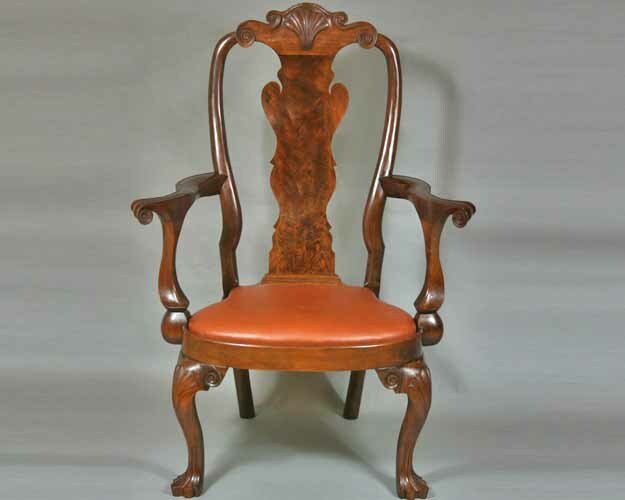 Kubalak's goal as a period furniture maker is to continually increase his skill level by building increasingly more difficult pieces, establish a business to market his high style reproductions and to share his knowledge and love for period furniture with others.